The Washington, DC, think tank Third Way has commissioned a stunning collection of six possible use cases and artistic renderings of how advanced nuclear reactor technologies would fit in various communities. The images and uses cases are online in a new web page that is now part of the Third Way’s innovative advocacy effort for clean energy. Considerable technical expertise was brought in as part of the development effort from the INL’s GAIN program and the sustainable design team of the Gensler Design office in Washington, DC. Advanced nuclear has the potential to solve climate change and growing energy demand in emerging economies. Yet, to date, there have been little to no images or drawings created to illustrate how advanced nuclear energy works, and what applications it could be used for. Some of the other scenarios to be unveiled at the event include a large energy park that supports desalination and hydrogen production, and a transportation hub for electric vehicles and other types of electrified transportation. Advanced nuclear technologies can propel the world toward our climate goals by providing affordable, zero-carbon electricity and heat; supporting the growth of renewable energy sources; and supplying clean energy for water desalination, hydrogen production, and other processes that will be vital in creating a low-carbon economy. But a picture is worth a thousand words. Despite the huge impact advanced reactors could have on climate efforts when they start hitting the market in less than a decade, we have few images to help us understand where and how they’ll fit into our communities. That’s why Third Way partnered with the distinguished sustainable design team in Gensler’s Washington, DC office to visually tell the story of advanced nuclear and put its potential into perspective. These architectural sketches and renderings explain the important roles that advanced reactors will play in a variety of energy systems. And the innovative designs of new reactors allowed us to show nuclear energy integrated into communities like never before. Advanced nuclear is on the horizon. Now, with these images, we have a better sense of what we can look forward to. Reliable 24 x 7 power for data centers to keep the Internet alive. At the Third Way Suzy Hobbs Baker was one of the drivers of the project. In an interview at the exhibit opening held at the Fathom Gallery in downtown Washington, DC, on October 28th, Baker says Third Way is targeting three audiences with its renderings: policy makers, the press, and the nuclear sector itself, which could use the illustrations in discussions about the future of nuclear power. She notes that much of what you see in these images was brought to life by Gensler’s Sustainability Team in their Washington, DC, office. An excellent description of how that process worked successfully is found in the October 30, 2017, blog post at the Building Design & Construction website. According to the article, the Gensler agreed to accept Third Way’s commission “because we’re interested in being part of this conversation,” says Duncan Lyons, RIBA, LEED AP BD+C, a Senior Associate and Office Building Developers Practice Area Leader, who was the lead designer on this project. Other Gensler associates who worked on the renderings and sketches include Gregory Plavcan, Matthew Boland, Liz Resenic, and Katie Costa. One of the strengths of some of the cases is that they illustrate the use of hybrid systems, which are the matching of nuclear power with renewable energy applications. Third Way had help from several people at the Idaho National Laboratory in developing the technical basis for the use cases. They include Todd Allen, who previously had led the work at the INL on its National Science User Facility (the ATR reactor), Rita Baranwal, Director of the Gateway for Accelerated Innovation in Nuclear (GAIN), and Shannon Bragg-Sitton, Manager of the Systems Integration Dept., in INL’s Nuclear Systems Design & Analysis Division. In a presentation at the ANS Winter Meeting Brag-Sitton said that it is well known that a reduction in greenhouse gas could be achieved by non-emitting variable renewable resources like solar and wind. However, she added that among other impacts, increased use of variable renewables can result in a requirement for baseload generators to operate in a load-following mode. 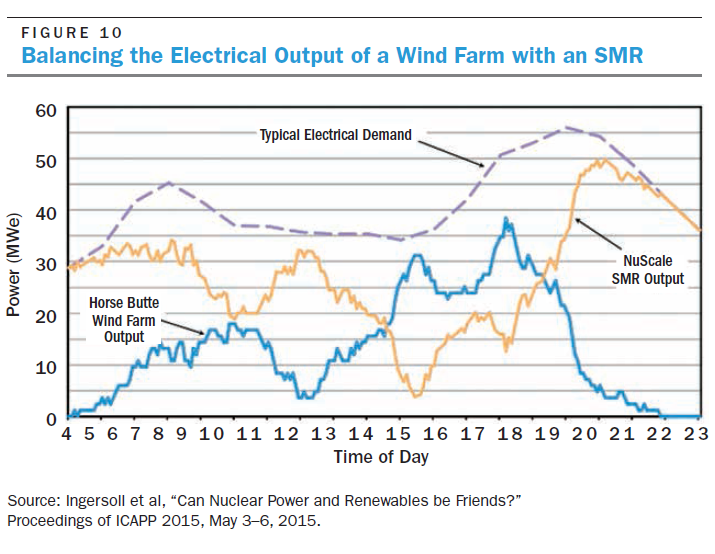 Integration of nuclear and renewable generators in a hybrid energy system (N-R/HES) is being considered as an option to meet both electrical and thermal energy needs. Bragg-Sitton added that the conceptual N-R/HES share many of the same requirements as observed for space power systems, likely also to be designed for multipurpose application. Left: Rita Baranwal, Director of GAIN at INL. Right: Suzy Hobbs Baker, Communications Adviser, Third Way; standing in front of one of the use scenarios unveiled October 28th in Washington, DC. Rita Baranwal told this blog in an interview held at the Third Way exhibit that “very creative thinkers (like Bragg-Sitton)” helped develop the multiple scenarios behind the use cases. Todd Allen, who is a professor of nuclear engineering at the University of Wisconsin, spent a year working at the Third Way and contributed his expertise to the advanced nuclear reactor use cases. Allen points to a new web page at the Third Way which updates its materials describing various advanced nuclear technologies. Freed is looking at options to put the images on the road to display them at university nuclear engineering programs, and possibly at public venues like libraries and shopping centers. Perhaps these images will inspire nuclear engineering graduates to want to work for developers of advanced nuclear technologies? Too bad we aren’t ready to plug into Puerto Rico a few Gen IV small modular reactors.